An alcohol dehydrogenase is required for the conversion of isobutyraldehyde into isobutanol. 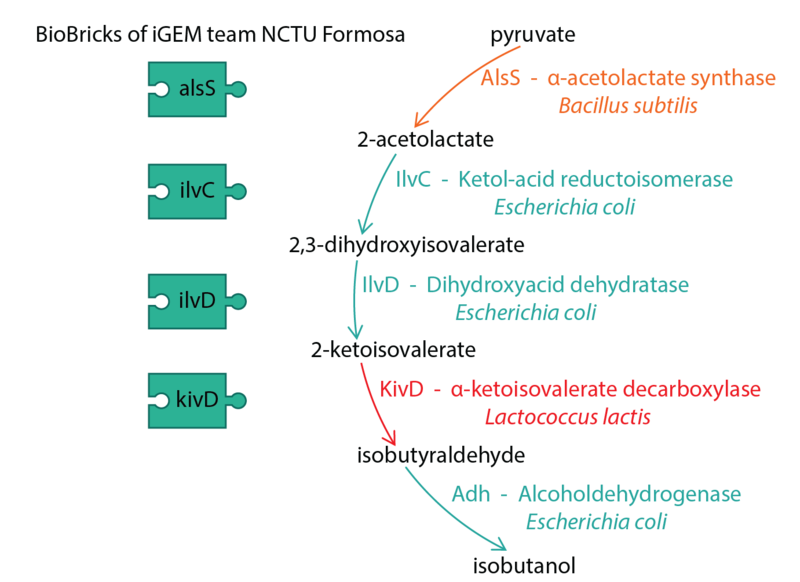 During our literature research about the isobutanol production pathway (Figure 1) we found out, that the alcohol dehydrogenase from Lactococcus lactis (AdhA) is more efficient than the one from Escherichia coli (Atsumi et al., 2008, Atsumi et al., 2010). For that reason we wanted to increase the production of isobutanol by cloning the adhA gene from L. Lactis downstream of our production pathway. The adhA from L. Lactis was not available as a BioBrick so we designed this part which contains the coding sequence combined with a RBS. For the protein expression analysis of AdhA from L. lactis we performed a cultivation of E. coli KRX with our inducible construct pSB1A2_T7_adhA (BBa_K1465304). Protein expression was induced with rhamnose when the culture reached an OD600 of 0,8. The first sample was taken right before the induction. Additionally we took samples one, two, three and 20 hours after the induction. With these samples, we performed a SDS Page (Figure 2). Figure 2: SDS page from pSB1A2_T7_adhA. One can see that the size of the band at a mass of ~ 38 kD increases the later the sample was taken. There is a conspicuously difference between the size of the bands at the point of induction and 20 hours later. This is an indication for the successful overexpression of the AdhA (35,776 Da). 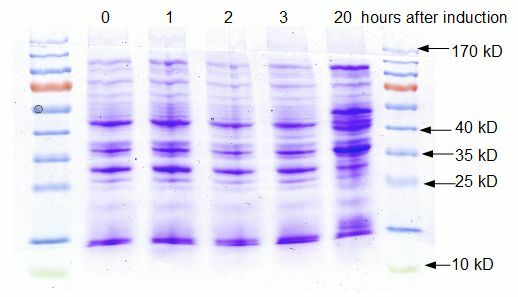 Analytics via MALDI-TOF identified the band at ~ 38 kD as the alcohol dehydrogenase (AdhA) from the organism L. lactis. The analysis was done via tryptic digestion and comparison to an in silico computed peptide mass pattern. Three matching peptid masses could be found and the sequence coverage (MS) was 13.3 %. The sequence coverage (MS/MS) was 4.0 %. Analyzing a second sample (the band was cut into two pieces), two identical bands were found with a sequence coverage of 8.4 % (MS) and 4.0 % (MS/MS). These considerations lead to the conclusion that the AdhA was successfully overexpressed in E. coli KRX. We successfully created three new BioBricks (BBa_K1465301, BBa_K1465304 and BBa_K1465305). We also could demonstrate the successful overexpression of the AdhA from L. lactis in E.coli via SDS Page and follow-up MALDI-TOF analysis. This part is used in our isobutanol production pathway (BBa_K1465307). An alcohol dehydrogenase is required for the conversion of isobutyraldehyde into isobutanol.